We love creating special memories for Guests on all our Dubai Desert Safaris. Capturing these moments on video means you can relive those memories and share with family and friends after you leave Dubai for many years to come with your free Desert Safari video. 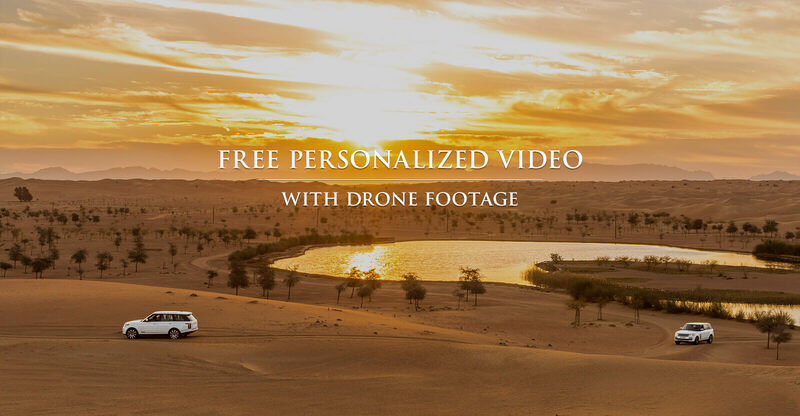 If you book with Platinum Heritage over a week in advance directly on our website and enter the promo code, you will receive a complimentary video of your Desert Safari experience. This is available on all our most popular Desert Safaris! The video will feature you and your family experiencing the wonders of the Dubai desert on your Wildlife Drive and on our Camel Desert Safaris. We have experienced drone operators that will capture your safari vehicle, either the vintage Land Rover or luxurious Range Rover as you travel among the golden sand dunes. After your Desert Safari, we will email your group’s complimentary video within the next few days so you can relive your desert adventure! Each video is valued at AED200 (over $50) and is available on our most popular Desert Safaris. You can find all the applicable Desert Safaris to choose from below. One video will be sent per booking and the offer is subject to terms and conditions.